I've read that in another Jeopardy match, Watson was surpassed by Congressman Rush D. Holt, Jr. That game was conveniently kept off the airwaves. I wish I could have seen it! 2 of those 3 links to your articles seem to be set up incorrectly. Funny how 'computers' and 'robots' were once seen as entirely different technologies. Welcome to a possibly new commenter? The commenter community has grown to the point where I don't always know if I've seen a user name before! In any case, I'd love to know the story on the Holt match. Anyone have a linkie? Jim - thanks for the heads up. I don't know what happened, but I tweaked the links and they seem to be working now. SciFi didn't always get it all that wrong. Forbidden Planet could be interpretted as a future where computing is so ubiquitous that people don't think of computers as separate entities. They're simply necessary components in all types of machines. Think of all the things they did with electronics that we would consider impossible (or at leat impractical) without computers. I'm not saying the filmmakers thought it through in technical detail, but they were on the right track conceptually. And we're actually already seeing this with embedded systems. People don't think of their smart phones or the electronic fuel injection in their cars as computers, but they have significant digital computing resources built into them. Also, the planetary computer of Altair IV illustrates something that is actually happening in computing. We might laugh today at a computer occupying 8000 square miles of volume. We might gag at gazillions of "klystron relays". (What, they use microwave amplifiers -- klystrons -- for logic switches!?) 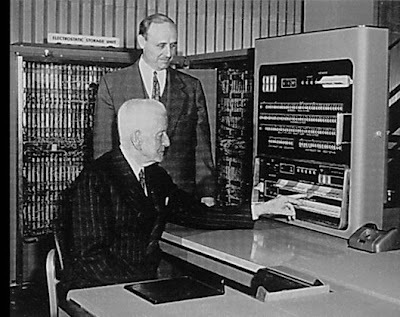 But the central idea that more computing power would mean more switches, not better ones, is pretty much accepted today. The first three are networked together using "Car Area Network" Which isnt ethernet but serves a similar function. This is the communication lines a mechanic connects to when they plug in their diagnostic tool. The Pcm or "car computer" people talk about is actually only the "main computer"
I imagine that a mid-future spacecraft will be the same - 100's of embedded controllers networked together probably with a lot of redundant controls built in. "Funny how 'computers' and 'robots' were once seen as entirely different technologies." Robots as a concept have existed, in the form of golems, long before people had any idea of the technologies that could facilitate them. Thanks! Here is a good article about Holt beating Watson. I liked your article about Amazon's crash. I wonder if you could take a look at my post on cloud computing, and give me some feedback. In The City and the Stars, Clarke describes the Central Computer of Diaspar in a way that we would call networked - when the protagonist goes to the main (immense) underground computer center, he reflects that what he sees might be only the switching system that kept all the city's machines in contact. Konzept, I'll take a look and comment in the morning! Doesn't anybody remember the "thin client" computing "revolution", and how that worked out? There are some problems with using microprocessors and modern RAM in an unshielded environment. It is already possible to get solar radiation induced errors, indeed one theoretical hack relies on it. Really advanced computation isn't currently possible outside a heavily shielded environment, or planet with a friendly magnetosphere. Raises the question whether independent drones might need to be heavier in space than you'd think, to allow for the cooling of the computer - currently we dump most computational heat into air although other mediums can be more efficient. "Target's leaking nitrogen, it should be possible to overload its fire control now." Space enthusiast decides the only way to get a significant human presence in space is to turn it into a reality show. Whole crew is under the onus of hamming up melodrama for the idiot audience back on Earth. Keep having to invent new social BS to keep the tension amped up. Project gets away from itself and they end up having to make up a deadly asteroid on a collusion course with Earth only they can avert to make it to the end of the season. Just another case of "What you have now is garbage!" but you sold it to us "It's garbage! This new shiny thing is the bee's knees! Buy it!" But it'll just be trash by next year. "Shut up and buy!" "Just another case of 'What you have now is garbage!' but you sold it to us 'It's garbage! This new shiny thing is the bee's knees! Buy it!' But it'll just be trash by next year. 'Shut up and buy!'" There is some element of that in the push to adopt cloud computing. But the point I was making is that the cloud computing is just another term for a thin client architecture. There were good an sufficient reasons why that never caught on in the 90s. Most of the technical hurdles have obviously been overcome, but there are still business reasons not to jump in head first. What I think will end up driving cloud adoption is the spread of mobile devices - once you have a desktop, laptop, and smartphone, anything stored locally on one of them is 'in the cloud' with respect to the others. I don't think the desire for local horsepower or storage is going to go away, however, no matter how hard Steve Jobs pushes it. But I have to consciously remind myself to back up this blog, which inherently lives in the cloud. I've said that the "cloud" as a pice of advertising rhetoric, is thin client computing warmed over. And it is. But having said that, use of the internet infrastructure and connected resources is going to be more and more important as we go forward. Online backup, for example, is an bovious application, because it leverages corporate economies of scale to provide its users with space, ease of use, and (in the best services at least) robust protection against disaster. It comes at the cost of security, availability, and reliability issues, but a lot of people see that as a fair trade. People also like being able to read their internet email on their smart phones, and I've certainly gotten good use out of AIM's ability to automatically route chats to your phone when you aren't connected from a laptop or desktop. So the "cloud" is a tale of two entities -- the marketing fantasy that people try to sell you and the operational reality that we've been using for years, to greater and greater effect. The perspective from which I'm mainly discussing cloud computing over at Infoboom may not quite fit either of those models, because it's not really about replacing traditional PCs - or any other personal device - with 'thinner clients,' but where and how firms deal with their data center storage. Having your data stored in your own company's basement feels a lot more comfortable, until the basement floods. "The perspective from which I'm mainly discussing cloud computing over at Infoboom may not quite fit either of those models, because it's not really about replacing traditional PCs - or any other personal device - with 'thinner clients,' but where and how firms deal with their data center storage. Having your data stored in your own company's basement feels a lot more comfortable, until the basement floods." Having your data stored, automaticaly, in several different locations, would be a powerful attraction...but also a source of concern. A modern day Sword of Damicles. When I think of "the cloud" it reminds me of projects like "SETI at home" where processing power is distributed over the internet, rather than having a supercomputer in the company's basement. I know you meant it in a figurative way, as a common expression, but the idea that gainful employment "puts food on my table" kind of irks me when I hear it in the modern world. Generally speaking, if you lose your job, you and your children are not going to starve. First, assuming the job you lose is one as a regular employee (which you may or may not be, but this assumption holds true for most of the folks who say their work "puts food on the table"), you'll go on Unemployment for a few months. This'll give you enough to feed your family, but you'll have to switch from Kellogg's Froot Loops to the generic lower-cost Froot-Loops-clone. Then, one that money runs out, the greatest danger isn't having no food on the table, it's having no table to put the food on -- you probably own or rent a home that was chosen based on the income level you had when you were employed. Take that income stream away, and you'll be behind on your mortgage/rent payments very quickly. You'll have to move somewhere cheaper, or move in with someone you know who'll help you out, or (in the worst case) live out of your car. Hopefully by then you'll have found another job to replace the one you lost, but not everyone is so lucky. In a worst case scenario, the next thing to usually go are doctor visits and prescription drugs. Starvation for you or your family is the very very LAST thing you'll have to worry about as your financial situation crumbles. In other words, putting food on the table CAN eventually become a concern, but the idea that the one-and-only job you have, right now, is the only thing that'll keep your family from starving tonight is ... exaggerated, at the very least, and outright misleading at the worst. 'Put food on the table' is probably best described as a synecdoche for 'making ends meet.' It is true that rent is generally a bigger consideration, and that food is pretty much the last thing financially strapped people will cut out - but that in itself is indicative. Food is something that a) we have to pay for, and b) actively consume every day, making it a very strong symbolic stand-in for survival. How about "Putting internet in the tubes?" jollyreaper said:"How about "Putting internet in the tubes?""